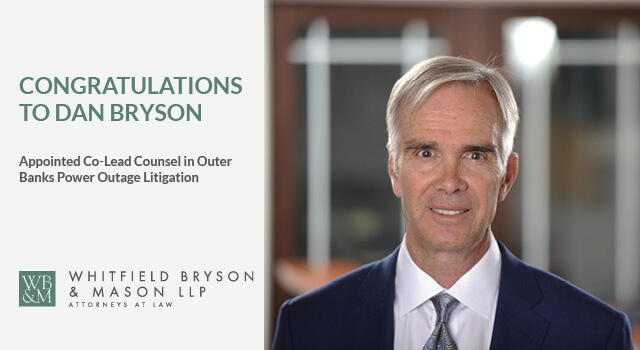 The offices of Whitfield Bryson & Mason LLP would like to congratulate Founding Partner, Dan Bryson on being appointed Interim Co-Lead Counsel in IN RE: OUTER BANKS POWER OUTAGE LITIGATION. Bryson was appointed by The United States District Court for the Eastern District of North Carolina Eastern Division. The Court also appointed attorneys from the Zaytoun Law Firm and Wallace & Graham, P.A. as Interim Co-Lead Counsel. Dan is one of the nation’s most respected and experienced attorneys in the area of consumer product defect litigation involving mass torts, class actions and individual lawsuits (condominiums and multi-family). Dan has also been lead counsel, co-lead counsel or a steering committee member in a number of successful MDL and class actions. For over 28 years, Dan has focused his practice on complex civil litigation, successfully representing thousands of owners in a wide variety of defective consumer product suits, class actions, and various mass torts and recovering more than $1.25 billion for his clients throughout the country. 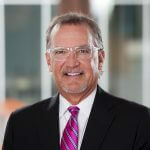 He frequently collaborates with other attorneys in order to assemble the most effective team possible. For nearly 30 years, John has been one of Kentucky’s premier trial attorneys. He has concentrated primarily on complex civil litigation cases, and over his career has brought to settlement or judgment over 30 cases in excess of a million dollars each.